1. How many choices do I need to insert before inserting a question? You need to insert at least two choices. And among these one option should be in selected mode. 2. How can I maintain a question bank for repeated insertion of questions? 3. Is selecting a category necessary while inserting a question? No. You need to select a category only if you would like to save the question into question bank. 4. How can I add a new category while inserting a question? Go to the category area and type in you category name there. Now your inserted question will move to this category folder. 5. Is it necessary that I need to type in something in the header Text box area? No. You can even leave it blank. 6. Do I have the option to show/hide 'Next/Back' navigation buttons on the published Quiz? Yes. All you need to do is to tick on/off the options as per your requirements. 7. How can I edit a question saved in question bank. You need to select 'Load Question' button and then edit the same. 8. Can Insert multiple questions from Question bank simultaneously? 9. Can I add Video, Audio, Flash, PowerPoint shapes to the question slides once they are inserted? Yes. You can add your own Video, Audio, Flash to the question slide just like you add them to any presentation slide. 10. How do I change the quiz template before inserting a question? Go to 'Quiz Templates' tab and select your template. 11. How can I enable/disable score in PowerQuizPoint? 12. After inserting question(s) what sort of modifications can I do inside powerpoint slide? 13. Can I delete and re-insert the text place holders inside question/ answers slides. 1. What is the minimum software requirement to run PoweQuizPoint? 2. What is the minimum hardware requirement to run PowerQuizPoint? 3. Why do I get the .NET framework version not found dialog? The PowerQuizPoint software requires the software Microsoft dot NET framework version 2.0 pre-installed on your system to work properly. Therefore you must first install this software before the PowerQuizPoint software is installed. You can download this software from Microsoft's web site. To do so, choose the option 'Download .NET framework version 2.0' in the above dialog and click Next. The PowerQuizPoint setup program will quit and you will be taken to the DigitalOfficePro page from which you can go to the Microsoft's download page to download the .NET framework version 2.0. Once you have downloaded and installed the .NET framework on your machine, you should run the PowerFlahsPoint setup program again. If your system does not have Microsoft Windows Installer 3.1, while installing the .NET framework version 2.0, you may be asked to install the Microsoft Windows Installer 3.1 as well. In this case, you have to download and install the Windows installer 3.1 before proceeding with the installation of Microsoft .NET frame work 2.0. 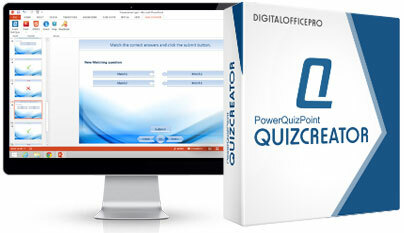 Then install DigitalOfficePro: PowerQuizPoint. 4. Why does the PowerQuizPoint toolbar not show up in PowerPoint? 5. What else should I do to make the toolbar appear in PowerPoint? 6. Why do I get Regasm.exe - Fatal error at the end of the installation? 7. What are the limitations of the Demo version? 2. Users can add ten questions only. 8. What should I do if the Publishing process hangs? 9. Before publishing, how can I make the resultant SWF presentation size smaller? 10. Does PowerQuizPoint support video embedded into presentation? Yes, it supports embedded Videos. 11. Does PowerQuizPoint support flash clips embedded into presentation? 12. Does PowerQuizPoint support any language other than English? 13. What audio file formats does PowerQuizPoint support? PowerQuizPoint currently supports audio files in .wav and .mp3 format.